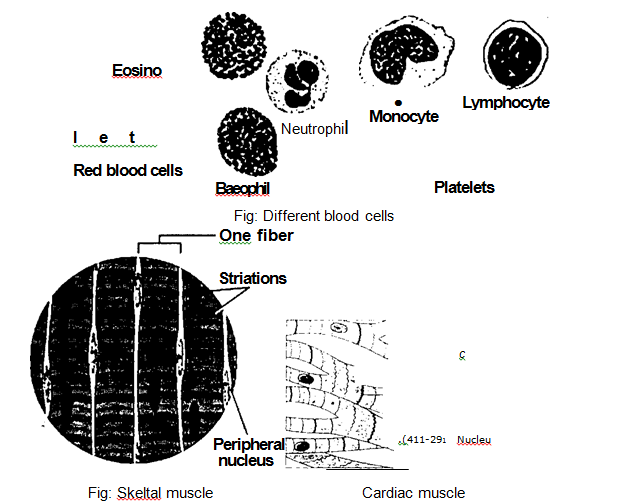 The tissue with loose arrangement of cells and the cells are scattered in an extracellular matrix are called connective tissue This non living matrix consists of a web of fibers. These fibers are embedded in a homogenous ground substance. This substance may be liquid, jelly like or solid. The nature of this – extracellular material determines the functional properties of the various. Connective tissues mainly bind and support other tissues. In most cases, the substance of the matrix is secreted by the cells of the connective tissue. 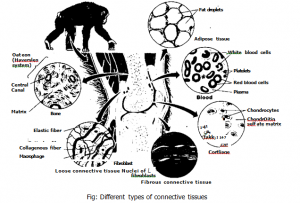 The major types of connective tissues are loose connective tissues, adipose tissue. fibrous tissues, cartilage, bone, and blood. They Five strong, flexible fibers of collagens. These fibers are interwoven with fine, elastic, and reticular fibers. The collagens make the loose connective tissue elastic. So it makes the loose connective tissues an excellent binding tissue. .They bind epithelia to underlying tissues. They are also used as packing material to hold organ. Adipose tissue is a type of loose connective tissue that store lipid. These cells accumulate in large numbers to.form fats. cells osteocytes lie within lacunae. The matrix surrounds them. This matrix avily impregnated with calcium phosphate. It makes this kind of tissue hard. ey are ideally suited for the functions of suppOrt and protection. d is a connective tissue. It has fluid called plasma. Plasma suspends initialized red and white blood cells and platelets. Blood transports various tances throughout the bodies of animals. m sin. There are three types of muscles tissue in the vertebrate body: skeletal mu cie, cardiac muscle, muscle. (a)keletal muscles: Skeletal muscles are attached to bones. The skeletal muscles are responsible for the voluntary movements of the body. Skeletal muscles are also called striated muscle. The overlapping filaments give the cells a striated appearance under the microscope. (b) Cardiac muscle: Cardiac muscles form the contractile wall of the heart. They are striated like skeletal muscle. But they are branched. The ends of cells are joined by structures called intercalated discs. (c) Smooth muscle: They lack cross-striations. They are found in the walls of the digestive tract, bladder, arteries, and other internal organs. Their cells are spindle-shaped. They contract More slowly than skeletal muscles. Smooth muscles are involuntary muscles. (a Neuron: The impulse conducting cells are called neurons. (b Neuroglia: The cells involved in protection, support, and nourishment are called neuroglia. (c Glial cells: These cells form sheaths around neuron. This sheath protect, nourish, and maintain cells of the peripheral nervous system.